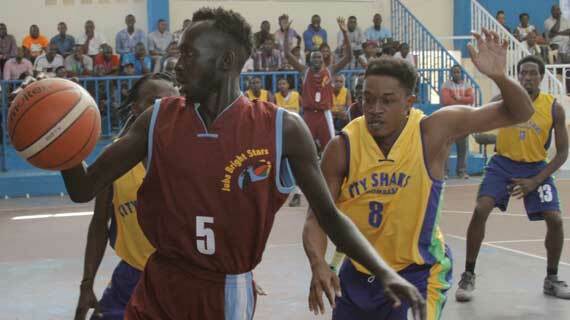 Nairobi and Mombasa opened their 2017 Africa Inter Cities Basketball championships with wins over Juba and Da-re-salaam on Sunday on day one of the week long action at the Nyayo National gymnasium in Nairobi. Six teams drawn from Nairobi, Mombasa, Mogadishu, Kampala, Juba and Dar-es-Salaam will feature in the tournament and will also compete for a prize kitty totaling Kshs.1.5 million. Despite an exciting performance that thrilled many fans at the gym, Juba failed to capture the day as Mombasa emerged victorious with a slim 69-66 win. Juba's Leek Manyuol was the Star attraction as he sank home 19 points on the evening. In the second match of the day , Griffin Ligare's 16 points powered Nairobi past a Dar-es-salaam in an 87-71 win.